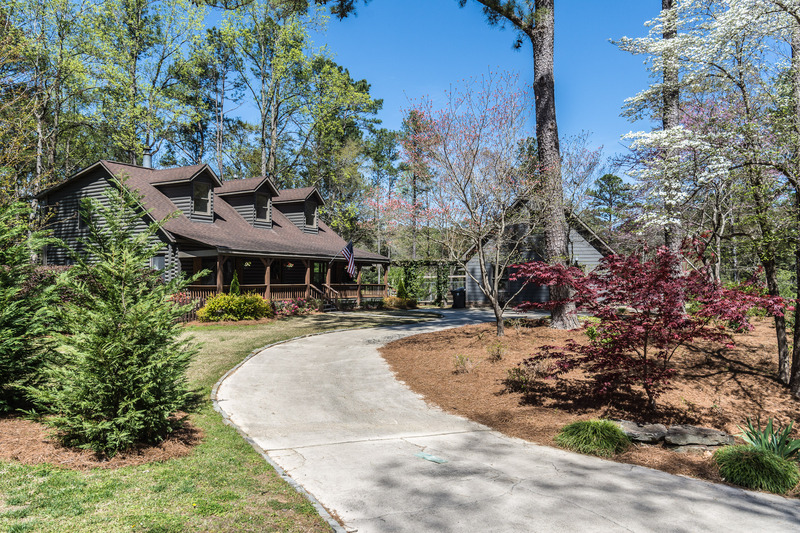 Rare opportunity in Lakeview Hills – a close-in, private lake community zoned for Vestavia Hills schools & convenient to The Summit, Grandview Medical Center, The Colonnade, 280 & 459! 3 BR, 2 BA log cabin home is updated & surrounded by landscaped grounds! Above the detached 2-car garage is a bonus room – studio, playroom or workout room w/ new hardwood floors! Exterior includes a front porch, huge deck, fenced yard w/ a flagstone patio w/ a firepit & a driveway turnaround. Living room is open & features a vaulted ceiling, hardwood floors & a wood-burning fireplace. Spiral staircase leading to the upstairs loft separates the living room & dining area. Open to an updated kitchen w/ granite countertops, stainless appliances, breakfast bar & pantry/cabinet space. Master on main level, includes doors to the deck & an bath w/ a granite double vanity/shower. Upstairs has a loft w/ a den & desk area, 2 BRs & an updated BA. New paint & new carpet throughout the upstairs. Don’t miss it! !